Avocados | Infonet Biovision Home. Brown stink bug. Real size: 6 to 15 mm long. Green stink bug. Real size: 6 to 15 mm long. Helopeltis bug. Real size: 7 to 10 mm long. Immature stage of the red banded thrips (Selenothrips rubrocinctus). Note a bright red band across the abdomen of immature thrips. Real size: about 1mm long. Healthy avocado fruits on a tree. The avocado is native to the Americas but grows well in Kenya. It is very nutritious with a high protein and oil content and is becoming increasingly important as an export crop. The avocado oil is cholesterol free, of the monounsaturated type believed to protect against heart disease and certain kinds of cancers. 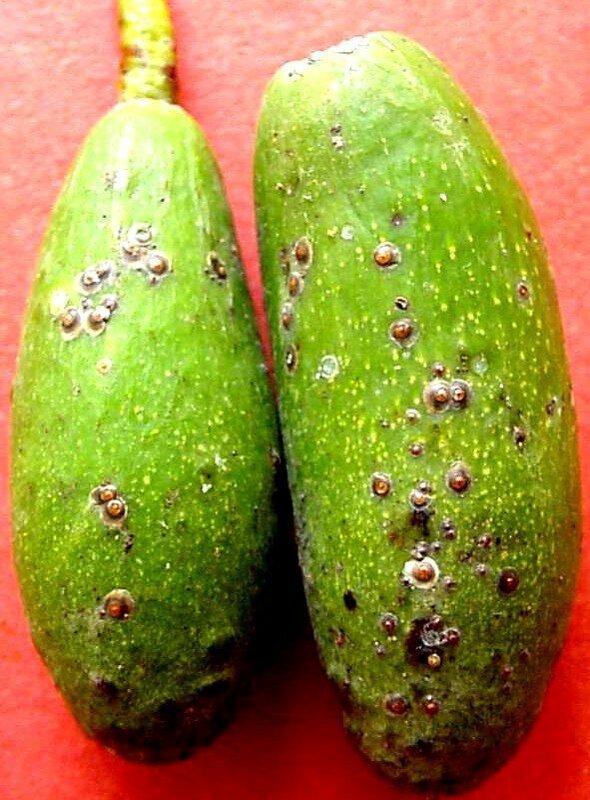 The fruit is nearly sodium free, is rich in potassium dietary fibre and vitamin B6, C, D and E. It is eaten as fresh fruit, in salads, soups, ice cream, also used to make avocado oil, perfume and avocado paste. Depending on variety, avocado grows well from 0-2100 m above sea level (asl). The varieties 'Tonnage', 'Simmonds', 'Booth 7&8' are suited to lowland areas between 90 and 800 m asl. 'Hass' and 'Nabal' are suited to altitudes 800-2100 m asl. 'Fuerte' and 'Puebla' are suited to altitudes 1500-2100 m asl. Avocado grows successfully on many types of soil provided they are deep, with good water holding capacity and free draining. 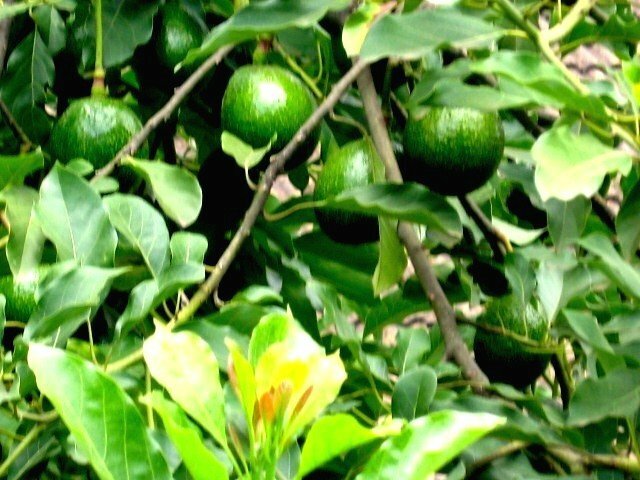 Water logged or saline soils are unsuitable because avocado plants are sensitive to excessive soil moisture and high salinity. The optimum pH is 5.5-6.5. Temperatures between 16 and 24degC are good for growing avocados. Maximum temperature for avocado is 33degC. Above this temperature avocado fruits and trees can be damaged. High temperatures and direct sunshine can cause sunburn damage to exposed fruit. Avocado will not grow where frost can occur. An annual rainfall 1200 mm is optimal for good production. Water requirements are not less than 1000 mm/year. If supplementary water is required not more than 50 mm at a time may be applied. 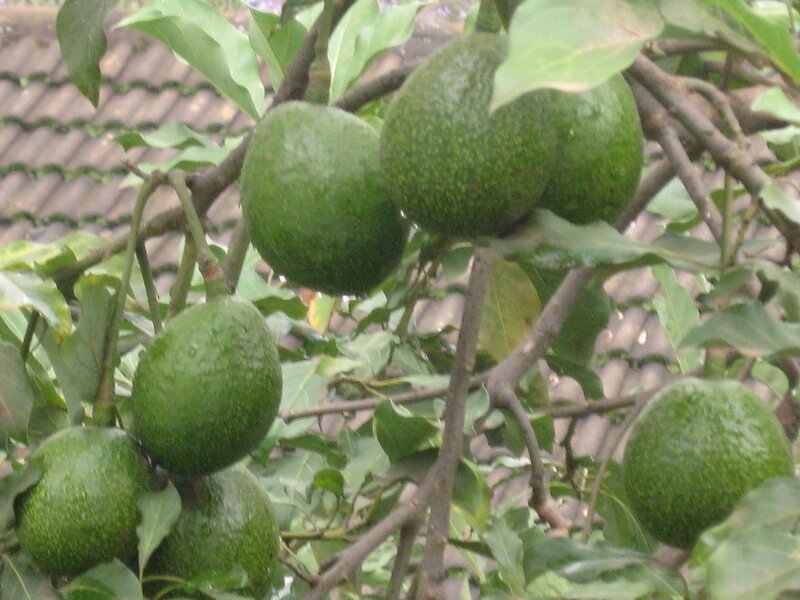 Climatic conditions with alternating dry and rainy seasons are best for avocados. 'Fuerte'. Hybrid of Guatemalan and Mexican races with thin skinned green-pebbled fruit of very good flavour. This variety has many lines with different shapes; the pear shaped fruit is preferred in the export market. Matures 6-8 months after flowering. 'Haas'. Vigorous grower and bears medium-sized, rounded, rough-skinned, black fruits. Propagates well. Matures 8-9 months after flowering. 'Nabal'. Bears fruit in alternate years. Its green fruits have a good flavour. Matures 8-9 months after flowering. 'Puebla'. Spreading, dark green tree bearing deep purple to maroon round fruit. This variety is normally used as a rootstock. Matures 5-7 months after blossoming. Select healthy, egg sized seeds and plant them in boxes or seedbeds. Immediately after germination transplant the seedlings into 4 litre pots, tins or polythene bags. Water them regularly until they are pencil thick. Grafting should be carried out when the seedling reaches pencil thickness. Wedge grafting method is most successful. Grafting should be done at the point where rootstock is soft. The scion should be dormant at the time of grafting and should match the size of the stock. Wrap the grafting point thoroughly to exclude water from the union and to prevent it from drying out. The fields should be cleaned by removing tree stumps, bushes and perennial weeds. Then the land should be mowed or cultivated. Generally a spacing for pure stands of avocadoes of 9m x9m will be suitable. Dig holes of 60cmx60cm by 60cm deep keeping the top soil and the sub soil separate. Mix the top soil with 1 bucket (20 litre) of well rotted manure or compost and 1-2 handfuls of Mijingu rock phosphate. Remove the plant from its pot keeping the root and soil structure intact (easiest if it has been properly wetted ahead of time) and plant out using only the topsoil mixture to fill the hole. The subsoil may be used to make a basin around the tree. Water the seedlings immediately after planting if it is not in the rainy season. Shade the young plants with banana leaves or similar material after planting and when they are putting up a new flush. If planted in a windy area, a windbreak will be necessary to protect the plants from leaning to one side and to help prevent leaf shedding fruit drop and bruising. Adapted from AIC advice for conventional farmers replacing conventional fertilisers with natural products to get the same amount of nutrients. Chlorine High concentration of chlorine in the soil may cause leaf burn, also damage the root system Apply lime and compost to neutralise the chlorine. Initial pruning may be done to give the tree a good shape. Otherwise pruning is limited to the removal of dead wood and parasitic plants. Remove all sucker and dead branches from main trunk branches. Prune canopy to keep the tree to a height of 5-8 m and for ease of picking. The tree is very susceptible to sunburn, therefore pruning should be minimised. Prune the larger tree roots by cultivating to a depth of 50 cm around the edge of the tree canopy. The area around the tree should be kept clean by weeding and removal of all fallen fruits. Harvesting starts at 3-4 years from planting but a good yield is obtained from the 6th year onwards. It is not easy to tell when the fruits are ready for harvesting unless they are of the varieties that change colour at maturity. Harvest a sample and keep at room temperature. If they soften within 7-10 days without shrivelling then the fruit of that age are ready for harvesting. 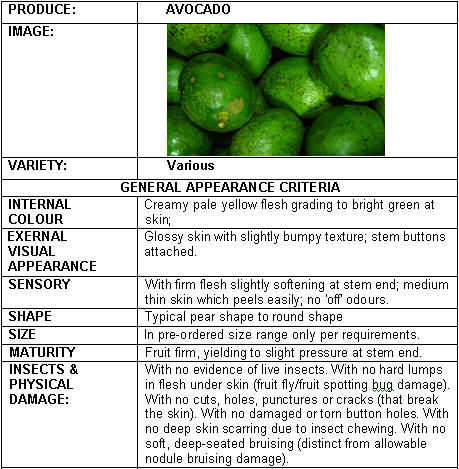 Insect pests are not serious constraints to avocado production at present. The false codling moth is small (wingspan of 16 - 20 mm), dark brown to grey in colour. The moths are active at night. Female moths lay single eggs mostly on the fruit. After emerging from the egg, the young caterpillar tunnels into the fruit and the fruit sap thus liberated forms a typical white crystalline excrescence on the surface of the fruit. When moths lay eggs on young fruits the caterpillars usually die and thus large caterpillars are seldom found. 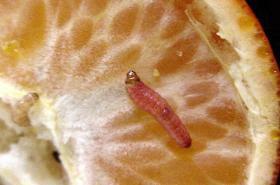 However, the caterpillars are able to develop if fruits are approaching maturity when infested. The young caterpillar is creamy-white with a dark brownish head. With age the body turns pinkish red. The fully-grown caterpillar is 15 to 20 mm in length. When mature the caterpillar leaves the fruit and pupates in the soil or beneath surface debris. Proper orchard sanitation in combination with natural enemies normally keeps this pest under control. Infested fruits (both on the tree and fallen fruits) should be removed regularly (twice a week), and buried at least 50 cm deep, or dump in a drum filled with water mixed with a little used oil. The fruits should be left in the drum for 1 week. This moth also attacks citrus, cotton, maize, castor, tea, guava and carambola fruits. 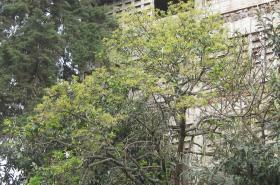 Other host plants include wild guava plants, oak trees and wild castor . These other host plants should be included in the sanitation programme. If possible, remove wild host plants from around the orchard. Caterpillar of the false codling moth (Cryptophlebia leucotreta). The fully-grown caterpillar is 15 to 20 mm in length. Avocados, especially thin-skinned varieties might be attacked by various species of fruit flies. Some fruit flies lay eggs under the skin of the fruit that is just beginning to ripen, but others attack young and old fruit. When the fruit reaches about the size of a golf ball a sting lesion appears as a slight puncture mark surrounded by a white exudate. As the fruit develops the lesion becomes dry and turn into distinct star-shaped crack on the skin surface. Apply baits (see more under Fruit fly). 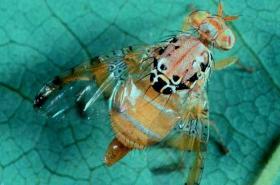 Fruit Fly (Ceratitis fasciventris) Adults are 4.5-6 mm long, brightly coloured, usually in brown-yellow patterns. The wings are spotted or banded with yellow and brown margins. Scales are small, stationary brown greenish insects occasionally found sucking sap from avocado leaves. Soft scales such as Coccus spp. excrete large amount of honeydew, which lead to the development of sooty mould on leaves, branches and fruit. Honeydew attracts ants, which while feeding on the honeydew protect scales from natural enemies. Armoured scales such as the coconut scale (Aspidiotus destructor) may encrust young twigs, leaves and fruit. They do not produce honeydew. Scales are usually not a problem in avocado orchards; however, damage can be serious on young tress and small twigs may be killed. Although the presence of scales on the skin of fruit does not cause internal damage, it may lead to rejection of fruit, especially if grown for export. Conserve natural enemies. Scales are usually kept under control by parasitic wasps, ladybird beetles and lacewings, provided no broad-spectrum pesticides are used and no ants are present. Thrips are small, slender insects (1-2 mm long) with two pairs of fringed wings. Adult thrips attacking avocado are dark brown or black, and the immature stages are yellow in colour. 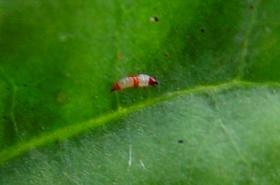 The red-banded thrips can be distinguished by a bright red band across the abdomen of immature thrips. Thrips are sometimes troublesome pests in avocado. They may cause damage to the leaves and fruit. Affected parts become whitish or silvery and are usually covered by dark-coloured droppings. On fruit, feeding begins near the calyx, gradually producing a scar that can cover the whole fruit. 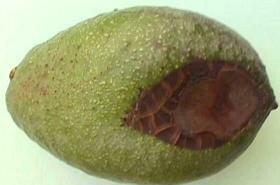 Attacked fruits develop a leathery brown skin. Feeding is most common on young fruit; economic damage generally occurs on fruit up to 2 cm in length (2-3 weeks after fruit set). Older fruit with thicker skin is less susceptible to attack. Conserve natural enemies. 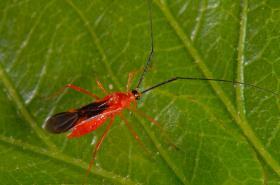 Thrips are attacked by predatory thrips, lacewings and predatory bugs. Control measures are rarely needed. Adult coconut bugs (Pseudotheraptus wayi) are brown in colour and 10 to 15 mm long. 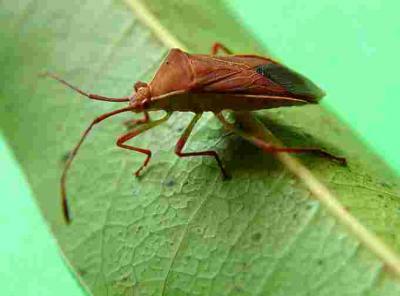 Nymphs are red brown to green brown in colour and have long antenna. The adults and nymphs of the coconut bug feed on young and mature avocado fruit. Bug feeding causes necrotic bruise-like depressions. A hard lump develops, which can be easily removed when the fruit is peeled. Helopeltis bugs also known as tea mosquito or mired bug are slender, delicate bugs, about 7- 10 mm long and have long legs and antenna. The females are red and the males are brown to yellowish red. The bugs prefer to feed on young plant tissue piercing the shoots, stems, leaves peduncles, petioles and fruits. Their feeding causes brown necrotic patches. 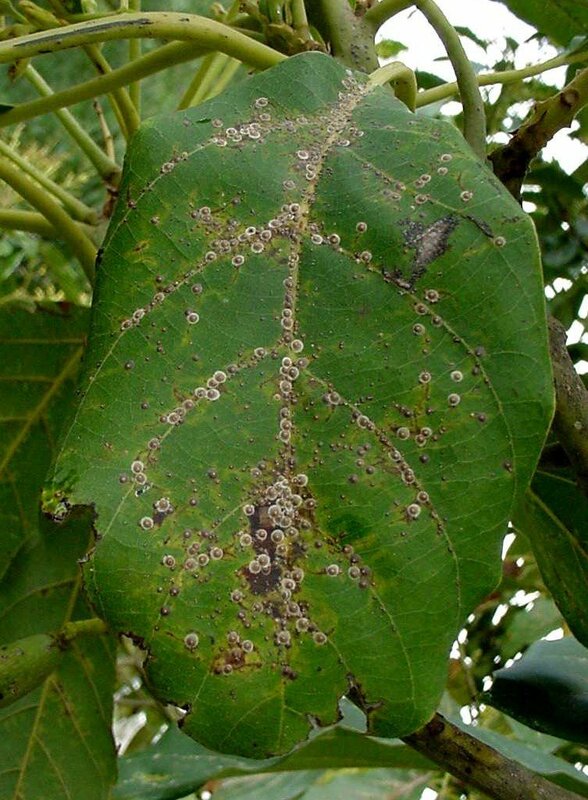 Attacked leaves present angular lesion, which often drop out leaving holes as it attacked by biting insects. Feeding on young shoots causes dieback of the shoots. Feeding on fruits causes first a dark water-soaked mark around the feeding puncture, turning into a lesion with a light brown centre and black edge. The fruit may exude sap that forms a whitish deposit as it dries. 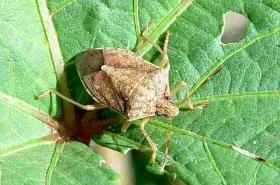 Stink bugs are shield-shaped bugs variable in size (6 to 15 mm long) and colour (green to brown or reddish brown). They emit a characteristic unpleasant odour when disturbed. They usually feed on the developing fruit. The feeding punctures cause local necrosis resulting in fruit spotting, and deformation. Conserve natural enemies. Weaver ants in particular, are efficient predators of bugs in the coastal areas of East Africa. Attack by spider mites (Oligonychus spp.) produce circular necrotic spots covered by dense webbing. As mite populations increase feeding causes leaf drop. These mites are more damaging to 'Haas' variety; 'Fuerte' variety is less affected. 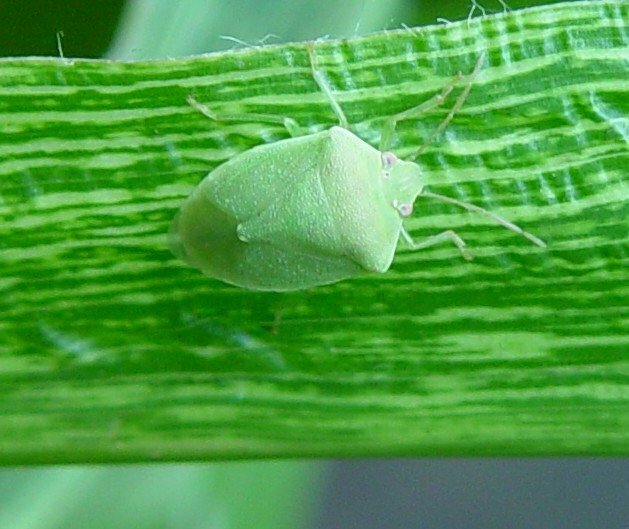 Feeding by broad mites (Polyphagotarsonemus latus) causes leaf distortion. These tiny mites (0.1-0.2 mm long) cannot be seen with the naked eye, and are even difficult to detect with a hand lens. 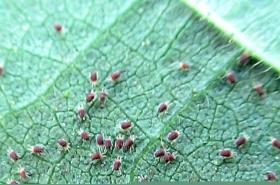 An attack by the broad mites can be detected by the symptoms of damage. Their feeding produces discolouration, necrosis and deformation of tissues. Conserve natural enemies. Mites are attacked by a range of natural enemies which can keep the pest under control provided that the natural enemies are not killed by application of pesticides. Wash the leaves with water using high-pressure hoses. This helps to reduce mite populations. Irrigate and fertilise adequately heavily infested trees to maintain the flush of new growth that occurs after leaf shed due to mite attack. However, care should be taken not to overfertilise trees to avoid promoting mite populations. The fungus readily infects young, succulent tissues of leaves, twigs and fruits. Lesions appear as small dark spots, slightly raised, oval to elongated. These spots join up, giving a corky appearance to the surface of the fruits, impairing the appearance but not the internal quality of the fruit. Fruits are only susceptible when young until about half size development. The fungus requires moist conditions for sporulation and infection. Remove dead branches and twigs since they harbour the fungus. Remove fallen rotten fruits from the field. Apply copper-based fungicides pre-flowering, at fruit formation, and after harvest. This disease can attack trees of any size and age. Leaves of infected trees are small, usually pale or yellow green, are often wilted and fall prematurely giving the tree sparse appearance. In advanced stages of the disease, branches die-back and fruit remains small and crop yield drastically reduced. Feeder roots get blackened, decayed and died. Infected trees die prematurely. The disease is prone in areas subject to flooding and in poorly drained soils. The fungus can be spread or introduced to new areas by use of infected seeds, infested soil, irrigation water containing spores of the fungus and infected seedlings. The host range of the fungus includes Acacia, Camellia, Casuarina, Cypress, Eucalyptus and Grevillea. Treat seed for planting in a hot-water bath at 48 to 50 degree Celsius for 20 minutes. After the hot-water treatment, rinse the seed immediately with clean, cold running water and spread out to dry thoroughly on a clean surface not in contact with the soil. Use clean nursery soil for container-grown plants. The soil should be well drained and carefully irrigated to prevent excessive moisture. Use tolerant/resistant rootstocks (e.g. "Duke No. 6" and "7"; "G 6"). Remove diseased trees from the field. Avoid movement of soil or water from diseased to noninfested areas. Use cultivation equipment first in healthy portion of the orchard before use in diseased areas. Washed and dry cultivation equipment after use in diseased areas. Root rot of avocado tree. Note sparse yellowish foliage. 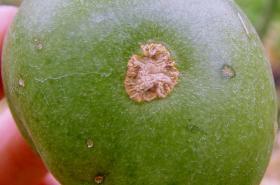 This fungal disease is primarily a post-harvest problem when fruit is at maturity stage. Infection takes place when fruit is still very young and the fungus stays dormant till the fruit ripens. The disease appears as depressed spots on the fruit and the spots are manifested as a rot, which can penetrate deep into the flesh. In wet weather, the spots may be covered with mass of slimy, salmon pink fungal spore mass. The disease may develop very rapidly in storage if conditions in storage are humid and warm. The anthracnose fungus lives saprophytically on twigs, rotten fallen fruits and dead or dying infected leaves. The fungus is spread by water splash. The disease is primarily a problem to quality of fruits. The severity of infection varies from season to season and can cause losses of up to 60%. The lesions appear as small light-yellow spots on fruits and leaves. They later become reddish brown and eventually become hard and crack. Mature fruits are resistant. The disease development is favoured by humid conditions and high temperatures. The fungus is essentially spread by water splash and its spores are also wind-borne. 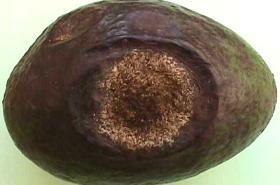 Avocado fruit showing a lesion caused by Cercospora (Pseudocercospora purpurea). De Villiers, E. A. (1990). 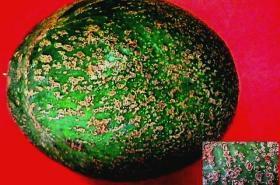 Avocado Pest in South Africa. In Framing in South Africa. Avocado. Institute for Tropical and Subtropical Crops. Published by ARC. HCDA. (1996). Avocados. Export Crop Bulletin: No 2 June 1996. ICIPE (2006). A Field Guide to the Management of Economically Important Tephritid Fruit Flies in Africa. The International Centre of Insect Physiology and Ecology. ISBN: 92-9064-179-7. Mugambi, D.M. (2001). Market Status of Avocado and Associated Products in Kenya. RELMA Working Paper No. 12. RELMA, Nairobi, Kenya. Muigai, J.K. and Mwaura, F.M. (2005). Preparation and Use of Avocado Oil and Its Products. Chapter 16 in Organic Resource Management in Kenya Perspectives and Guidelines. 2005. Forum for Organic Resource Management and Agricultural Technologies (FORMAT). National Horticultural Research Station, Thika (1984). Horticultural Crops Protection Handbook. Ministry of Agriculture & Livestock Development, Kenya. Protrade. Avocados. Export Manual Tropical Fruits and Vegetables. Tree Crop Propagation and Management (2000). A farmer Trainer Training Manual. Integration of Tree Crops into Farming Systems Project- GTZ, Ministry of Agriculture and Rural Development) MoARD.